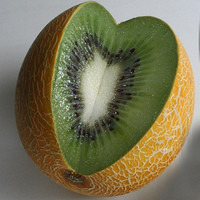 As its invigorating tart kiwi bite quickly gives way to full-bodied juicy sweetness, this exemplifies the supremacy of the Arctic Beauty variety of the emerald fruit over its fuzzy brother. Served cold as the winds on the snowy slopes of Caradhras, it makes for a guaranteed refresher. This recipe is the property of Apexified and released under the CC Attribution 4.0 license. You may not copy, derive or commercialize this recipe without following the terms of this license or the explicit permission of the creator. Cold, Sweet, Tart, Juicy, and refreshing. This hits every note you want in a summer recipe and it does it with nuance and transformative properties. Easily a 5 star recipe by an excellent mixer. I can already tell I'm going to be mixing up a 120 as soon as i polish off this 30. I had the pleasure of previewing this recipe before it was released and found it to be incredible. It starts with that tart crispness like biting into a skin-on kiwi but without the fur, followed by a satisfying deluge of sweet juicy goodness with an icy finish. Great work, Apex!